If you're relaxing at home enjoying a plate of flapjacks this New Year's morning, savor it while you can. 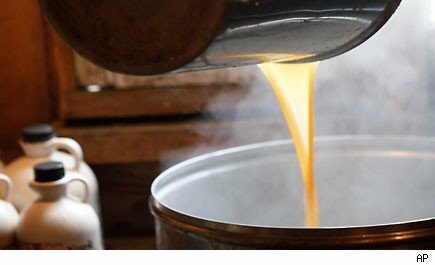 The brazen theft, over the course of a year, of millions of gallons of maple syrup from Canada's strategic syrup reserve (yes, there apparently is such a thing), could spell higher prices for the "liquid gold" in 2013. The mystery began back in August, when the Federation of Quebec Maple Syrup Producers was checking inventory at its St.-Louis-de-Blandford warehouse, a key depot in the strategic reserve and home to some 3.4 million barreled liters of the sweetener. But instead of the expected unadulterated reservoir of syrupy goodness, the inspection revealed barrel after barrel to be empty. Apparently, a gang of sweet-toothed thieves had rented warehouse space adjacent to the syrup depot and worked their way into the locked and guarded space to siphon its sugary contents. In all, authorities estimate that some 16,000 45-gallon barrels of syrup were drained from the depot over a period of nearly a year. The long-running heist yielded an estimated $20 million to $30 million worth of syrup. The good news: Last week, the Canadian Mounties got their man. Their men, actually. So far, 18 members of a syrup "trafficking" ring have been arrested in connection with the theft. A further seven suspects are still at large, and perhaps -- we're seriously not making this up -- vacationing in Florida for the winter. Police say they've tracked down two-thirds of the stolen syrup, which had been shifted across the provincial border to New Brunswick in tanker trucks. That still leaves one-third of the heist unaccounted for -- well over 200,000 gallons of pure maple treasure, equal to roughly 2 percent of annual maple syrup production globally. Authorities believe that during the year-long heist a lot of the stolen syrup was sold onto the world market. Poetically put, the thieves have probably flooded the market with "hot" syrup. Even if it has been ladled out in drips and drabs, the addition of more than 2 percent of global syrup production to the supply chain has almost certainly worked to depress pricing. It is, after all, an ironclad rule of Economics 101: When supply goes up but demand remains steady, prices go down. Unfortunately, there's a downside to this rule of economics. Namely, by artificially inflating supplies of the natural sweetener in 2012, Canada's thieves have necessarily decreased supply of syrup in 2013. Post-theft, Canada's producers simply don't have as much syrup on hand as they once thought they did. This suggests that the new year could see higher prices for pure maple syrup than would otherwise have been the case. When combined with a poor corn harvest in the U.S. from this past summer's drought, that's likely to increase the cost of lower-quality syrups, such as the "maple-flavored" corn syrups sold in U.S. supermarkets, as well. Moral of the story: Thanks to the Canadian Mounties, crime still doesn't pay for the criminals. Sadly, American breakfasters may still wind up paying more for their pancakes in 2013. Motley Fool contributor Rich Smith thinks this would be a really sad story... but he still can't stop chuckling at the thought that Canada has a strategic syrup reserve.